The 2016 Thunder Road Brewing Company Victorian Fistball League Season came to a close yesterday with Fist Club capping their fantastic season by taking out the Roger Willen Shield for the first time. 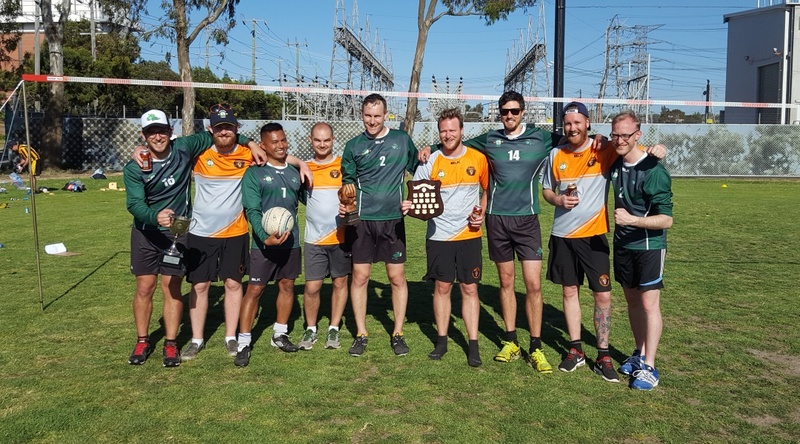 Despite losing in the final to defending champs the South Melbourne Fistball Club, Fist Club had accrued enough points on the season to win the league title by 3 points. Congratulations on a great year Fist Club and good luck in your title defence next year. South Melbourne (aka The Green Demons) won Fistivus XXII to take home the Peter Norman Trophy for the first time in 2016, a nice consolation prize for finishing runners up on the season. The Fistroy Lions finished in third place on the day (aided somewhat by the inclusion of 3 international fistballers), while newcomers the Mutt Fisters put in an encouraging performance to finish 4th in their first ever hit out, and showed that they will be a force to be reckoned with next year as they gain more experience. With their most impactful attacker mostly watching from the sidelines due to “daddy duty”, the Bay City Fisters missed the semi-finals for the first time this season, falling to 5th in their final appearance of the year. Regardless, their third place overall in the Roger Willen Shield is an impressive improvement over their last placed finish in 2015. At the foot of the table the race to avoid the wooden spoon also went down to the wire with FistStorm being the unfortunate ‘winners’ of the dreaded award, finishing below the Westside Wombats on percentage. Lee Morony of the South Melbourne Green Demons was voted Best & Fistest on the day, his second B&F of the season, and a result that has surely pushed him into hot favoritism for the 2016 Klemens Kronsteiner Medal to be counted early next year. And so concludes the 2016 VFL season, one in which we saw 9 teams match up over the course of 7 tournaments, competing in 338 fistball matches to win 4,419 individual fistball points. Beers consumed during the season probably tallied somewhere near that last figure too. 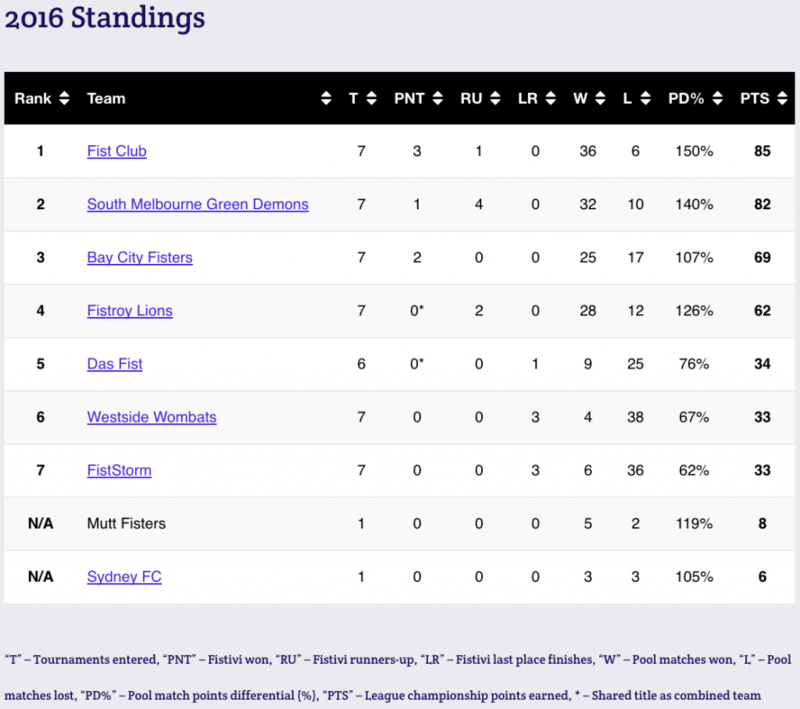 Final standings for the 2016 VFL season can be found below, and in the Results & Fixtures section of the Local Competitions page. Thanks again to everyone who participated and helped out in what was a great season. Stay tuned in the coming weeks for details on our Fistmas Party and for information on the 2017 Season which will be starting early in the new year.